Happy Memorial Day! MDW officially kicks off summer, so that summer body better be ready! It’s kind of ironic: we kill ourselves in the gym and with keeping a healthy eating plan, only to spend the summer eating fatty cuts of processed meats, nutrition-less fried startches, and washing it down with adult beverages. Then, it’s a sleigh ride into the holidays and their indulgences so we can start over again next January. Vicious cycle. But there are ways to stay on track even when attending fun events like BBQs and beach parties: BYOS (Bring your own sides). While hotdogs and hamburgers aren’t exactly tofu, the proteins aren’t the biggest culprits. Mayonnaise based sides like potato salad and cole slaw and heavily processed potato products like chips and French fries are the real culprits for the extra belly fat. Well, that and the beer (we’ll let you know when we find a comparable substitute for that one ;). Quinoa is usually described as a good fill-in for rice, but it’s actually more flexible in that you can serve it either warm or cold. 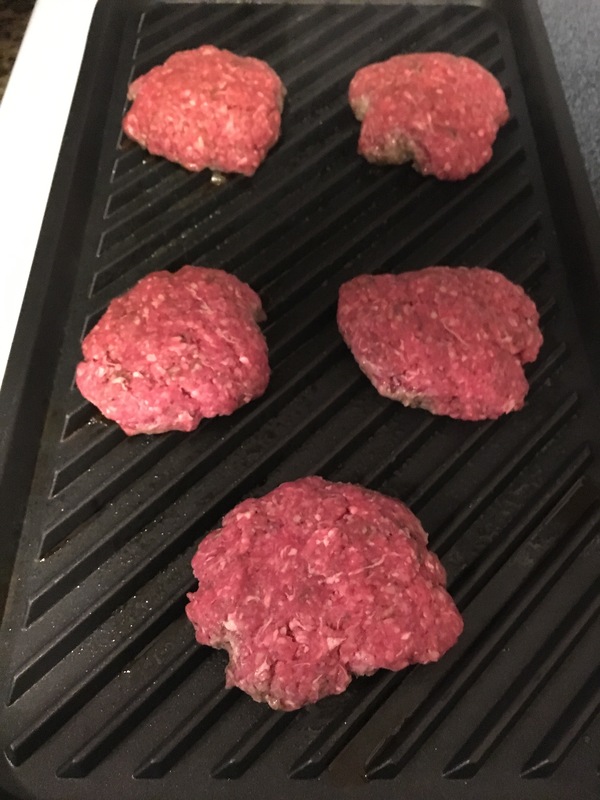 In this case, we are using it as a nice, cooling base for our sizzlin’ hot burgers. 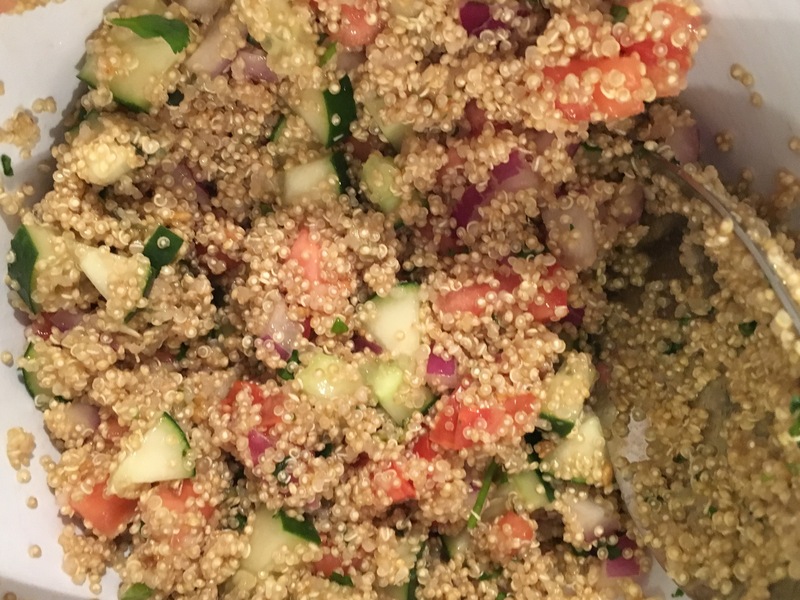 To cook, 1 cup of the quinoa was combined with 1 1/2 cup of water in a pot and boiled until all the water was absorbed. Quinoa does not have much of a taste on its own, so normally we heavily season it to give it a flare. In this case, we added a quarter of the lime and cilantro into the boiling water to add some zest to it. 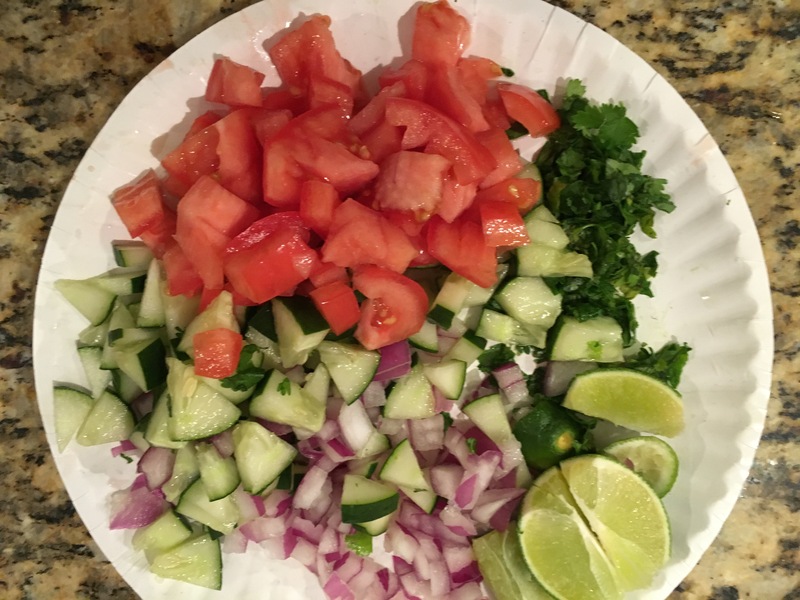 Once cooled, diced tomatoes, cucumbers, red onion, cilantro, and the juice of the remaining lime were added. Put in refrigerator to chill. 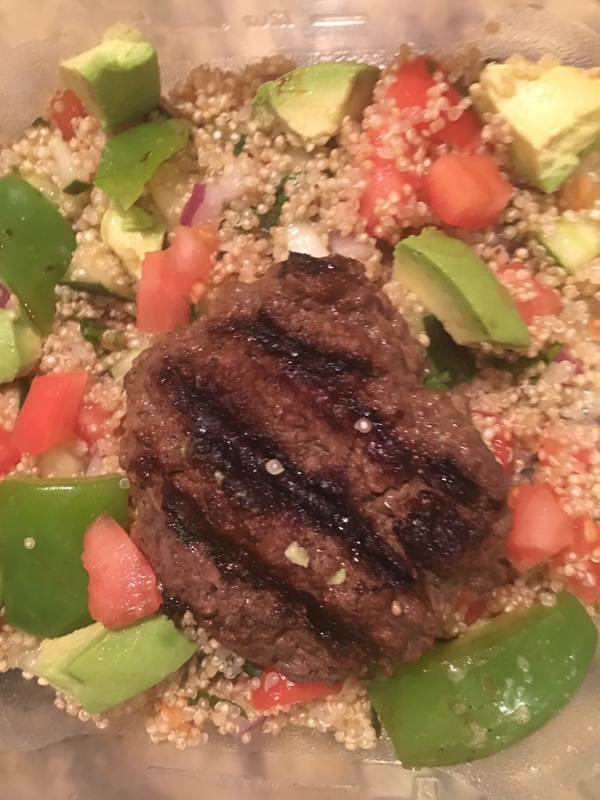 Burgers: For our meat, we choose 1 lb organic, grass fed beef (makes about 5 burgers). 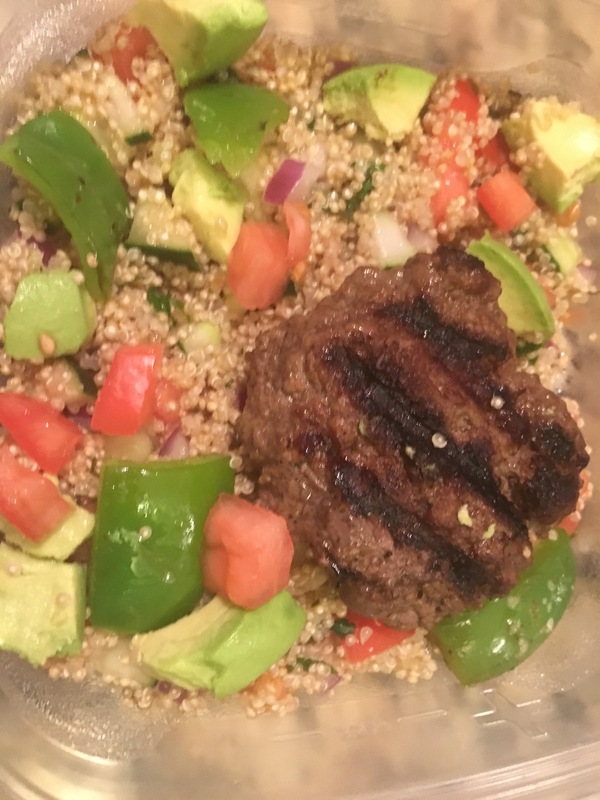 It will give you all the flavor of a regular hamburger without the nasty, processed extras. To compliment the chilled quinoa, we went extra spicy with our seasonings. Cayenne, chipotle, cumin, black pepper, salt, a pinch of raw sugar, and a dizzle of balsamic vinegar for moisture were added, so these bad boys are anything but flavorless. They were cooked on a stove top grill for about 10-15 mins each side. Garnished with avocado and green peppers, the meal has a southwest yet All- American feel. This goes to show you that BBQ food doesn’t have to be fatty and repetitive. Happy summer!